One of our favorite stores is celebrating her 10th birthday! 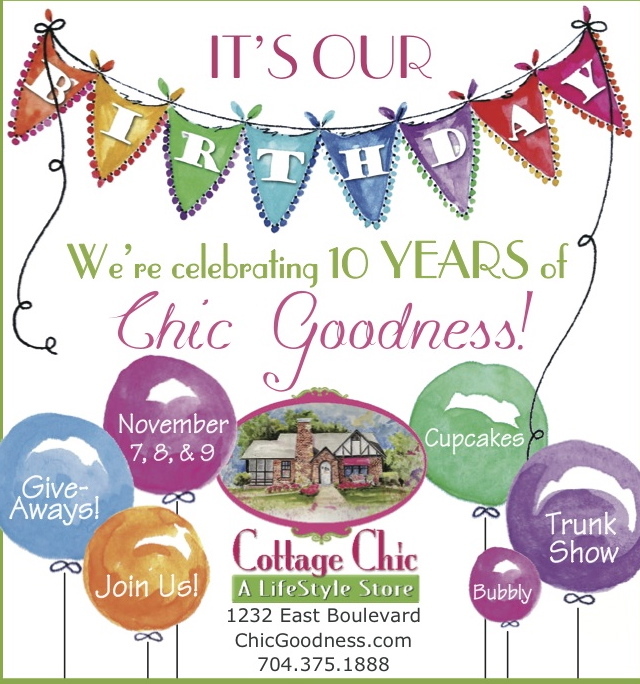 Join us in giving Cottage Chic a pink & green birthday hug! Tomorrow through November 9th they’ll have lots of giveaways and treats, just because it’s their birthday! BELLA NOTTE TRUNK SHOW. All orders will be 20% off, and any orders over $500 will receive a free set of pillowcases of your choice. (some exclusions will apply) Rep from Bella Notte will be here Thursday. DRAWINGS: Enter to win one of TEN $100 gift certificates, a Caldrea basket and other surprises! And of course it wouldn’t be a celebration without pink cupcakes and bubbly too! Summary: The new SEA LIFE Charlotte-Concord Aquarium is opening in Spring 2014 at Concord Mills! To help get off to a swimming start, SEA LIFE is searching for a panel of 10 young students, ages 8-12, in the Charlotte-Concord area who are passionate about marine life and want to get their feet wet. Do you know a child who loves sea creatures and wants to help protect them? Click here to read how to enter to be an official SEA LIFE Charlotte-Concord Young Environmentalist. Summary: Activities include: the infamous pumpkin slingshot, corn box, straw castle, sorghum pressing and cooking, kettle corn, the widest variety of fall decorations in the area for sale and more. All activities are included with admission with the exception of the pumpkin slingshot ($1.00 per pumpkin to shoot) and decorations. Be sure to plan your trip so you can enjoy feeding the animals as well as the fall activities! Regular admission rates apply. If you have any additional questions, please call us at 704-663-5100 or visit us on Facebook! Summary: Dirt fans from all over the world will flock to The Dirt Track at Charlotte Nov. 7-9, to witness the seventh-annual World of Outlaws World Finals. Serving as the season finale for The Dirt Track, the World Finals features the stars of the World of Outlaws Sprint Car Series, the World of Outlaws Late Model Series and the big-block modifieds of the Super DIRTcar Series as they come together to crown their respective series champions. Summary: Charlotte Country Day School invites you to learn about how your child can experience exceptional academics and preparation for life. You are cordially invited to attend a jewelry and glass trunk show featuring North Carolina artist Lisa Oakley. Lisa will have a varied selection of glass jewelry, bowls, balls, pumpkins, pears, and more! Perfect for your holiday gifts, and don’t forget to treat yourself! Bring your Mint membership card to receive a discount of 10 percent off all purchases over $10. Summary: Enter a world of pure imagination with Charlie Bucket as he takes a tour of Willy Wonka’s Chocolate Factory. Summary: Matthew Bourne, the world’s most successful dance choreographer, and his company New Adventures, bring their spectacular and lavish new production of SLEEPING BEAUTY to Charlotte, direct from a record breaking season in London’s West End. Bourne is the only British artist to have won a Tony Award® on Broadway for both Best Choreographer and Best Director and has won over 50 international awards for his choreographic work, including the Broadway production of Mary Poppins. Summary: There’s more than enough fun and confusion for all! Get lost in our giant seven acre corn maze featuring over two miles of interconnecting paths. One of the largest in the Southeast, our maze is sure to please! Looking for an even bigger challenge? Traverse the maze in the dark during one of our famous Family Friendly Friday Night Mazes! Bring your own flashlight and an appetite for adventure, there’s even music and bonfires! (weather permitting) The whole of Rural Hill’s 265 acres is available to you and your group during maze hours- take a hayride around the farm, play a round of corn-hole, explore our historic site, play in our mini-mazes, have a picnic, hike our trails, pick a pumpkin (in October) & much, much more! Summary: Corn maze, hayrides, animal barn, grain bin slide, 1800s train car, kid’s play area, tumbleweed roll (new for 2013), horseshoe and corn hole, boys’ club house and girls’ castle, kiddie corral (for 5 and under). Need I say more? Summary: Our 7 ACRE Corn Maze is fun for ALL AGES! If you are bringing little ones, you may need to bring a stroller for them. There is a good chance they may get tired of walking. Remember you will be walking on FARM LAND, therefore, there may be places where the land is uneven, and yes there is a good chance you may get your SHOES DIRTY. We recommend you wear sneakers or closed toe shoes. Summary: Pumpkin patch and hayrides. For more information on all featured exhibitions and exhibitions click here. For more information on all featured shows and shows click here. For more information on all featured movies and showtimes click here. For a complete description of all nine theme areas click here. 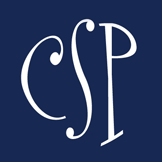 For a complete listing of all featured shows and shows click here. For all current and upcoming events click here. For complete details on exhibitions and exhibits click here. For a complete schedule of show times click here. Summary: YMCA members and non-memebers are invited to come enjoy a few hours of family fun! There will inflatables, face painting, an outdoor movie, s’mores and more. Summary: Join SMART START of Mecklenburg County for a free parent workshop for parents of young children with an Autism Spectrum diagnosis. Summary: It’s time for another Soccer Shots FUNfest, and it’s also the 100th birthday of soccer in the US! Bring the family to this free event to celebrate an awesome fall season of Soccer Shots and 100 years of soccer in the United States. There will be bounce houses, face painting, music, soccer and fun! We will also be selling raffle tickets to win free Soccer Shots seasons and Soccer Shots fun packs, and Kona Ice and Vic the Chili Guy will have food for purchase. All proceeds will go towards our non-profit, Soccer Shots Global Goals, which works with the US Soccer Foundation to provide underprivileged children across the country, the opportunity to play soccer in a safe environment. Summary: Ticket price includes music, FREE parking, beer, beer and great company. Music by Back Porch Bluegrass. You may even catch a glimpse of our feathered friends, between sets. The live and silent auctions feature the winners of our 2013 photo contest. All proceeds benefit Carolina Raptor Center. Due to capacity restrictions you must reserve free tickets for 9 and under. Summary: You are cordially invited to attend a jewelry and glass trunk show featuring North Carolina artist Lisa Oakley. Lisa will have a varied selection of glass jewelry, bowls, balls, pumpkins, pears, and more! Perfect for your holiday gifts, and don’t forget to treat yourself! Bring your Mint membership card to receive a discount of 10 percent off all purchases over $10. Summary: Jimmie is in the hunt for another championship! Build the #48 car with a pull back motor. Summary: Please join us as we bring to life something we care deeply about – preparing students to lead lives of meaning and purpose. Let our students, teachers, and leaders show you what learning looks like in the life of a Cannon students. Summary: What better way to wrap up the fall season than with your canine pal and several hundred of their new best friends? Bring your family, friends, and dog (or dogs) to the Rural Hill Sheepdog Trials and Dog Festival November 9th and 10th for one of the area’s best known dog events, now in its nineteenth year! No other dog festival in the area can offer more fun or variety! Summary: Honored tradition continues! The event showcases local middle and high school bands, the Junior Reserve Officer Training Corps (JROTC) program units, active military units, antique cars and veteran organizations. Summary: Could be the most excitement you can find for only $2. Bring the entire family and enjoy! Dirt fans from all over the world will flock to The Dirt Track at Charlotte Nov. 7-9, to witness the seventh-annual World of Outlaws World Finals. Serving as the season finale for The Dirt Track, the World Finals features the stars of the World of Outlaws Sprint Car Series, the World of Outlaws Late Model Series and the big-block modifieds of the Super DIRTcar Series as they come together to crown their respective series champions. Summary: Thousands of pumpkins to choose from, enjoy a hayride and feed the animals in the barn. Summary: The Carolina Renaissance Festival is one of the most interactive entertainment shows ever created with wonderful amusements and antics on going all around you! Enjoy non-stop entertainment presented on 11 stages every event day. There is comedy, music, dancing, circus performers, jousting knights on horseback, and much more! Sit back and relax or become a part of the action as you are surrounded by over 500 costumed characters roaming the festival village!